﻿Here's a view inside the box. I like the inside of things (especially purses) to be a light color. My eyes find things much easier on a light surface. 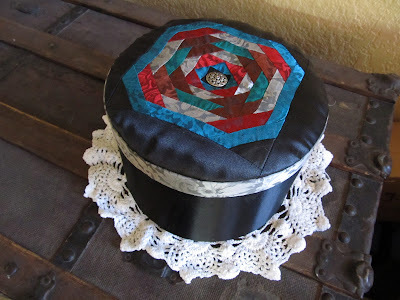 BUT since I was using scraps I did not have any pieces of the lightest fabric to cover the bottom of the box so.... that's why I pieced a 4-patch for the center, then surrounded it with the silver to make it big enough to cover the bottom. Improvising, isn't that how we sometimes end up with our best designs. I had never covered a box with fabric before so didn't have a clue where to start. The worst part about this project is the lid doesn't fit! It was a tight fit BEFORE I covered it which is the reason I chose this slippery thin fabric. This was a FUN project but don't see myself ever doing another one. Hope your weekend allows you time to visit your mind and heart to think upon the ultimate sacrifices made by those in service to our country. Just one day out of the year to honor our loved ones, our ancestors, our friends who died in conflicts and wars -- not to honor war, but those that died in those conflicts and wars. 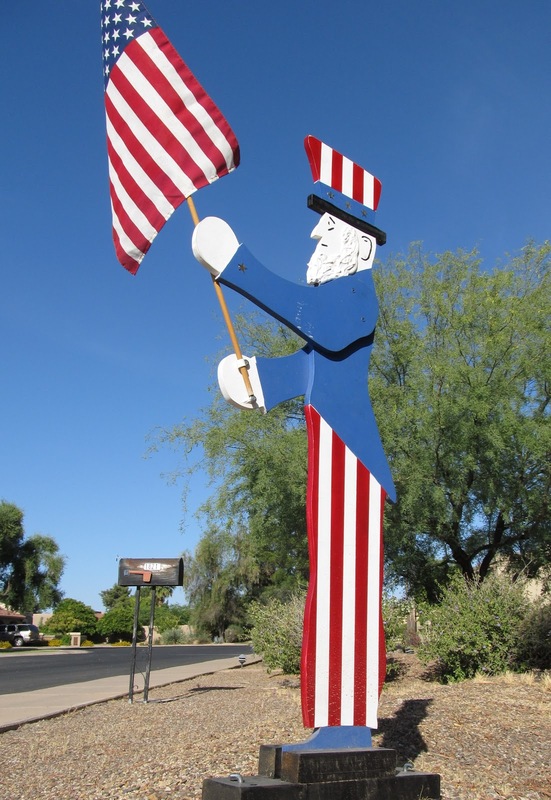 Remember those that have given the ultimate sacrifice for this country and your way of life. Who Is That Woman Behind Those Foster Grants? This is a snapshot of my world today. When I saw it, it cracked me up so I grabbed my camera so I could share it with you. This dedicated quilter forgot to put her reading glasses in the sewing kit but wasn't about to let that stop her from quilting. 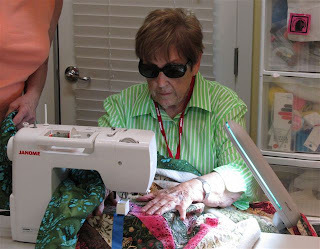 So she grabbed her bifocal sunglasses and started stitchin'. Yesterday I attended a meeting of the Phoenix Modern Quilt Guild. They are a relatively new guild having formed in 2010. But it seems this year it is growing in leaps and bounds, there were 5 new people at this months meeting. This was the second meeting for me. 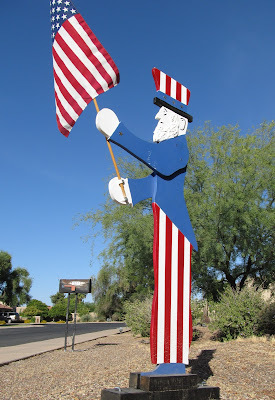 The meeting was held at Scrapbooks ETC in Mesa and there were enough attendees to fill their large classroom. The meeting mostly consisted of a hand embroidery workshop. 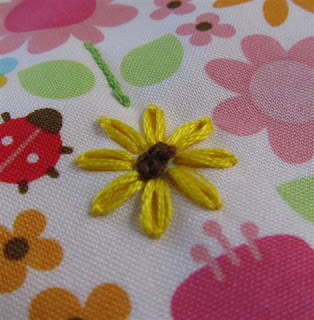 Our instructor, Danny Heyen, shared lots of embroidery stitches with us. The picture above is a sample of the Lazy Daisy stitch with a couple of French Knots in the center of the flower. Back in the day... like 40 years ago, I did a lot of hand embroidery but haven't done much since. It was a nice refresher course and I'm inspired to find ways to embellish some of my work with floss and needle. Yesterday as my hubby was coming home from work he stopped and bought three quick picks for the POWERBALL. This is not NORMAL behavior for him, playing POWERBALL. He does all his gambling in Vegas. But with the jackpot SO high I guess he couldn't resist. He also stopped and picked up take out for dinner (I know... he's a keeper). So we eat our dinner which included fortune cookies, those are FUN little things. 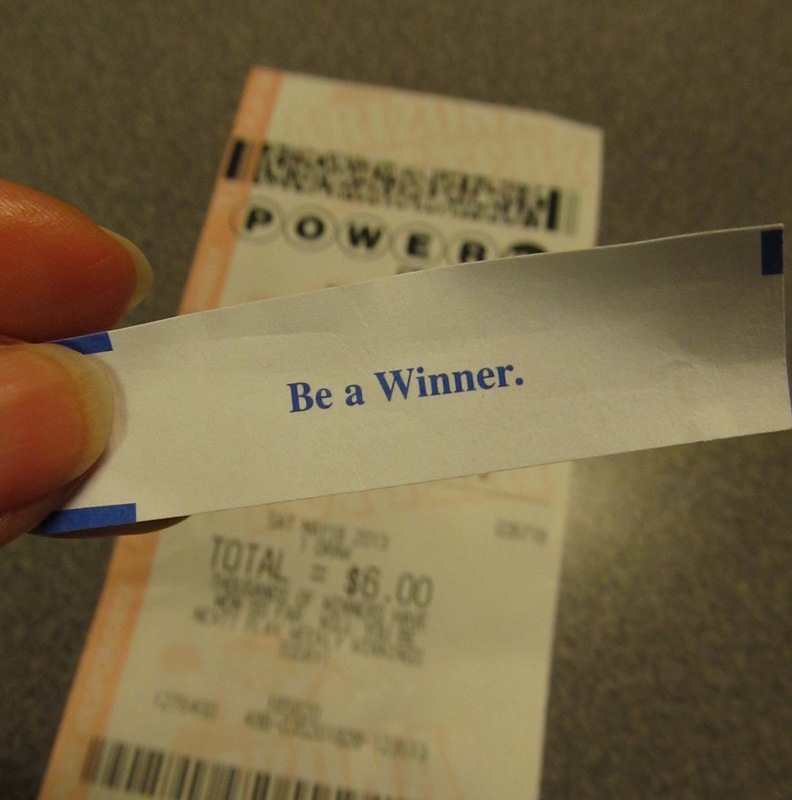 When I opened my fortune cookie and saw this I really was left speachless! You know, every quilt has a story and this one is no exception. 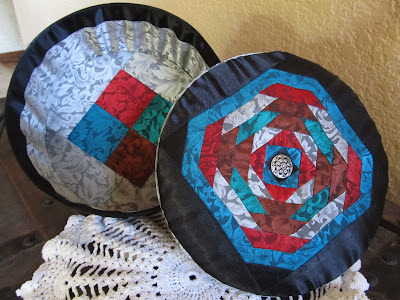 Quilter didn't use up ANY of her fabric but still found a way to go SHOPPING for fabric. 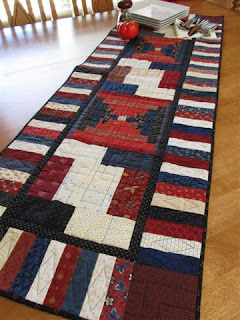 AND she now has a red, white and blue tablerunner that will work perfectly for the upcoming Memorial Day holiday. So... Have You Tried the Spoon Trick Yet? ﻿In the past few weeks I have bumped into several quilters (also blog readers). The first topic they want to cover is, "Where have you been?". Turns out they've missed my blog ramblings. WHO KNEW people were actually reading this stuff! The next topic they want to discus is the spoon trick (unless they haven't tried it!). 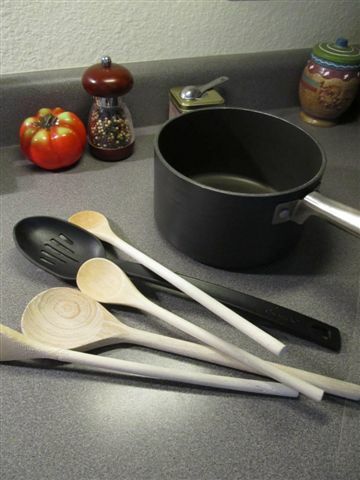 Turns out the spoon trick works with everyone's stove, pans and spoons. It never fails that if the person I'm talking with doesn't bring up the spoon trick it's cuz they haven't tried it.